1973 Wine Service in the Restaurant by G.F. Hasler, founding member of the Guild of Sommeliers. 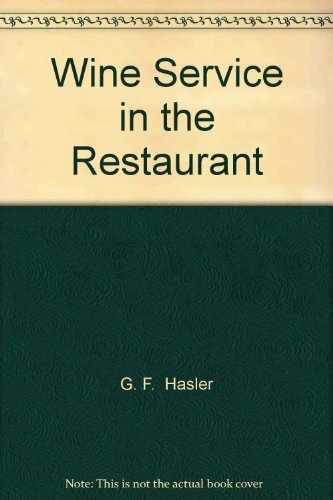 The author, Mr. Geoffrey Hasler, MS is a founder member of the Guild of Sommeliers (Not the Court of Master Sommeliers) and wrote this book to help further the education and training for the wine professional. He became a Master Sommelier in 1972. I bet it was used by many aspiring Master Sommeliers in the 70's and 80's. I love the classic chapters like "Mis-en-place", "Cigars and cigarettes", "Knowing your guest". The steps of service haven't changed much in 40 years, but in some cases, less relevant for today's restaurants. After the popularity of the Chablis Masterclass I lead at Chicago "Somm boot camp", I'll be bringing this lecture back to a limit of 40 seats. All proceeds go to No Kid Hungry. We'll be tasting some of my favorite producers. Don't miss this class and a great way to do something good for the kids! I'M ENDING CHILDHOOD HUNGER IN AMERICA — AND YOU CAN HELP. Please support me with a small or large donation to Share our Strength. I'm helping end childhood hunger in America by riding 300 miles in three days with Chefs Cycle for No Kid Hungry.